« Wheat Germ & Herb Biscuits and a Super Food Giveaway! 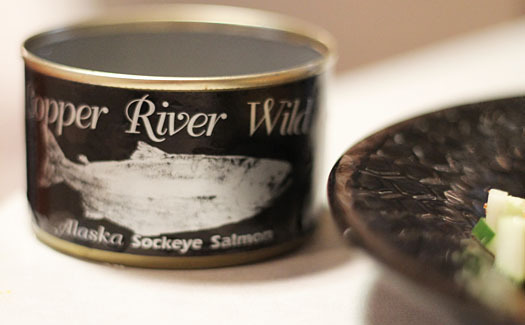 On the last shipment from Copper River Salmon, I got a package filled with smoked and canned salmon goodies. Such a nice way to end my time on the Fresh Catch Crew! 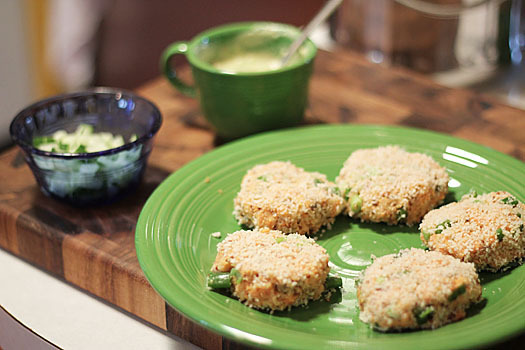 The canned salmon was the last to be used and here’s what I did: Salmon Cakes. 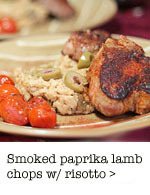 So easy to make, something like this is perfect for a weeknight dinner! And if you do have an avocado, I recommend making the sauce too. Very zippy and creamy. Unfortunately, my avocado was extremely pale, so the photos don’t really do the sauce justice. You’ll just have to trust me. It was delicious and very avocado-y. Also, this could certainly be made with leftover, cooked salmon if you had some. 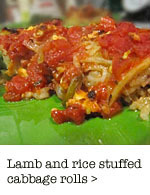 I also find that there’s no definitive recipe for meals like this — a can of salmon (5oz? 7oz? doesn’t really matter! ), an egg, diced onion, bell pepper, maybe chopped olives, salt, pepper, whatever and then bread crumbs until it’s the right consistency. 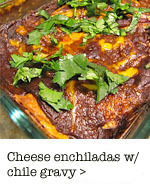 This is a great type of recipe to experiment with, so have fun! 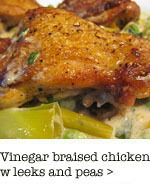 Adapted from a recipe from Gourmet magazine; makes 4-5 salmon cakes. Make sauce: Pulse avocado with mayonnaise, lime juice, salt, sugar, and one fourth of chile in a food processor until chile is finely chopped. Add milk and purÃ©e until smooth. Add more chile if desired, processing until smooth. 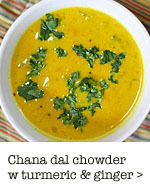 Transfer sauce to a bowl and chill until ready to eat. 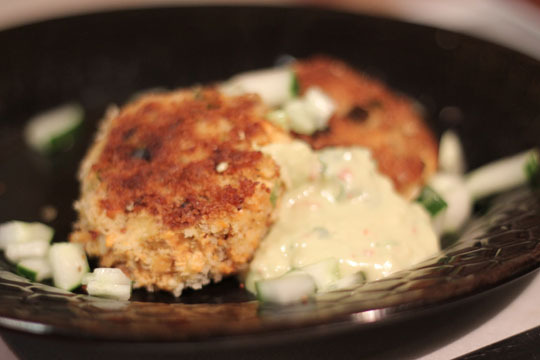 Make salmon cakes: Stir together salmon, egg, green onions, lemon juice, mustard, salt, pepper, red bell pepper, garlic and 1/4 cup of the bread crumbs in a large bowl until blended well. If needed, add a few more bread crumbs. You want enough bread crumbs to be able to make cakes that will hold together nicely. Form into four (or five) patties and dredge in the remaining 1/4 cup bread crumbs. 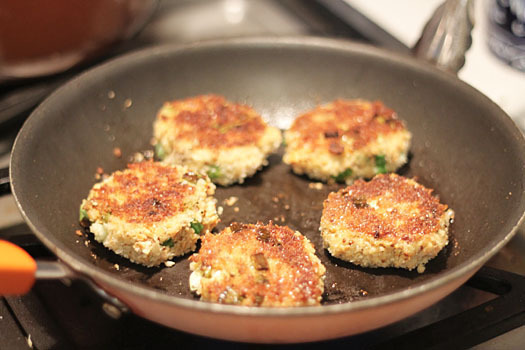 Heat the olive oil in a skillet and cook salmon cakes until heated through and nicely browned. About 5-6 minutes per side over medium heat. You can also bake the salmon cakes in the oven on an oiled baking sheet at 400 degrees F for about 15 minutes. Just flip them over about halfway through cooking time. 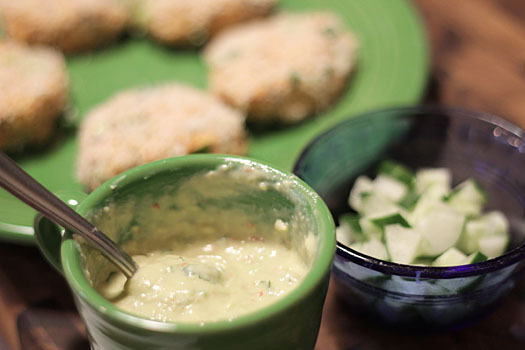 To serve: put two salmon cakes on a plate and some of the avocado sauce to the side. Sprinkle with some diced cucumber, if using. Had some cooked salmon that need to be used up and I made these for the kids and myself. Left out the jalepeno, added a little chili powder to the sauce and it was all good. 2 out of 3 kids ate it (the other really only wants to eat pasta everyday) and I went back for seconds.